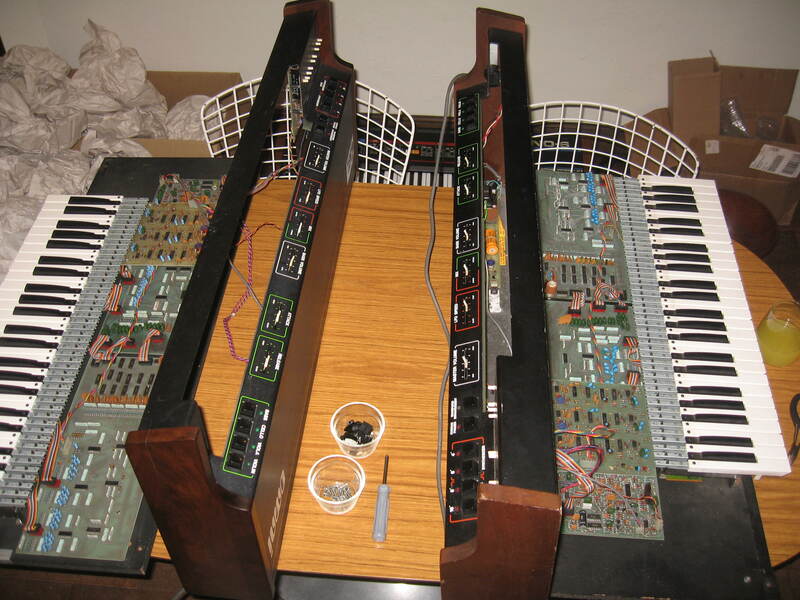 Preserve the Sound is a site dedicated to DIY vintage synthesizer repair and making music. I’m not sure how it happened -but I have two somewhat dead Arp Omni’s hanging around expecting my attention. I admit -they’ve been getting it, but I haven’t been thrown much of a bone in return yet. Unit 1: the silent type. Got it pretty cheap on eBay when there were several broken ones on there at the same time. I completely recapped it but it persists in its’ silence. Unit 2: Not quite as cheap but also not the silent type. Lots of bleed through from bad capacitors, but most of the functions sort of work. Who is who? Look at the capacitors. Complicated beasts these Omni’s -all out of proportion to their street value. So between the 8 boards in an Omni 2 there are about 80 capacitors of the Tantalum variety -those known to fail suddenly either closed or open. 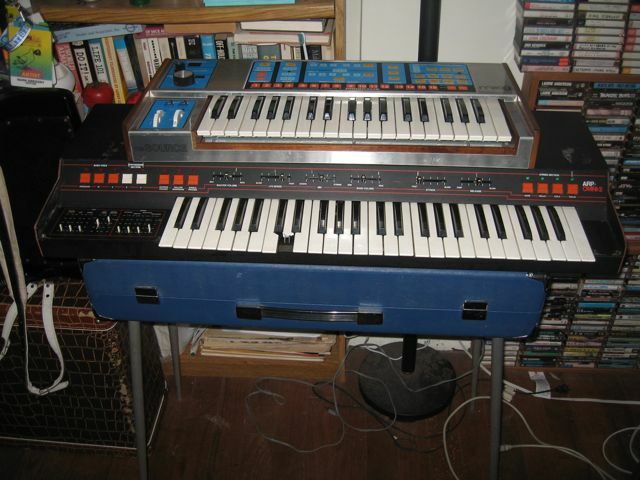 An Omni with its original capacitors is prone to fail with voices stuck on or voices silent -either way the synth becomes unusable as an instrument. Replacing a tantalum capacitor is straightforward enough -you remove the old one and replace it with a new one of the same capacitance and at least the same or higher maximum operating voltage and polarity while applying as little heat as possible to the board. Those little blueberries are the capacitors you’ve read so much about. There is a trick or few to removing them. 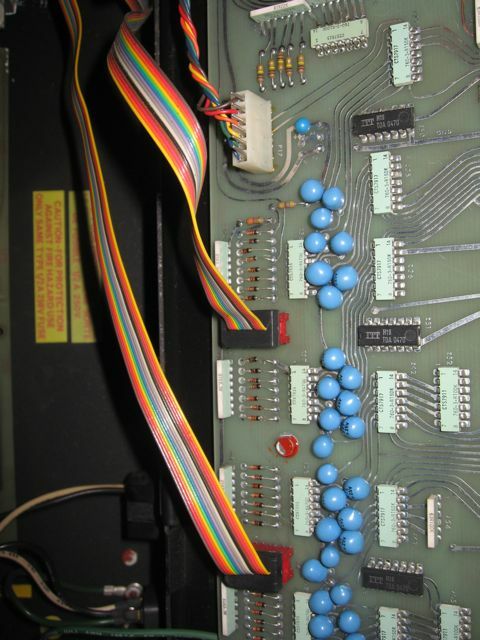 I probably took this picture to remind myself where the ribbon cables go. While I wait for my Juno 60 toggles I might as well tell you about my Omni 2… Here’s the first in a probably two part series. I bought this Omni 2 off Craiglist in April 2011 for the seeming current market rate of ~$200 for one that powers up, makes most sounds correctly and has some ‘lingering’ voices. While the lingering voices are alright if your fooling around, they are a roadblock to being able to make recordings with it -which is my intention. A quick web search told me this was a common problem and not difficult, just tedious to fix -with a high success rate for machines that have basic functionality when you start. Arp Omni 2 sandwich -the meats bigger than the bread. Source looks positively petite on it. Arp is pretty nice other than the chipped tooth -courtesy of careless TSA baggage handlers the PO told me. Note the 6 vertical panel sliders have caps -also note that each slider has a white grease pencil line -one way to store a patch!